It started as a way to keep a Longines FEI World Cup™ Jumping qualifier in Wellington, Florida, when the Rolex-backed Winter Equestrian Festival had an obvious sponsor conflict. But in three years, a very special four-day show – the CP Palm Beach Masters CSI3***-W – has been built around the featured Sunday class, and there are entries enough to keep it and the WEF going simultaneously in the “Winter Horse Capital of the World” on the first weekend in February. The $35,000 Welcome class at the Masters, for instance, drew 55 big name starters, while a six-minute drive down the road, 64 horses contested the $70,000 Equinimity Challenge Cup on the same day. The WEF’s major class of the weekend, the $205,000 NetJets 4-star grand prix, will run Saturday morning; the World Cup qualifier is Sunday afternoon, with many of the same riders in both. 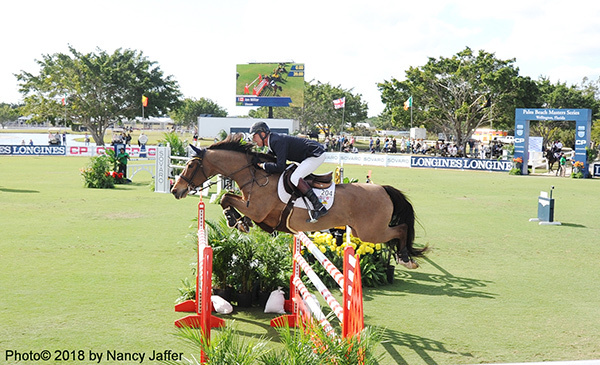 Although thousands of horses run through WEF’s 12-week series, the Masters, presented by Sovaro, is a boutique show. Brothers Louis and Charlie Jacobs who manage it with their parents, Jeremy and Margaret, at their family’s lush and scenic 300-acre Deeridge Farm (the largest private farm in Wellington) aren’t looking for participation from more than 400 horses at the most. “Every trip in the ring is a special event,” said Lou, explaining that equitation and low jumpers are not part of the plan. Since the Masters’ debut three years ago, it has morphed into the lead-up for a three-show series that includes hunters and young jumpers. Lou added the family would like to have more shows there. Although their applications to host a Longines Nations Cup have yet to bear fruit, he is eager to see that in the future. The Masters is part of the senior Jacobs’ legacy in the sport, as Lou put it. The hospitality offered at the Masters is simply stunning. The Jacobs family owns the Delaware North Corporation (their connection with the Boston Bruins hockey team is noted by a grand prix fence painted in its yellow and black colors) and among the company’s sports, tourism management and hospitality holdings is the Patina Group of fine dining outlets, including restaurants at Disney and New York’s Rockefeller Center. The Patina connection is reflected in the splendid array of food available in the Masters’ two-story VIP facility, offering great views of the fabulous grass grand prix field and the all-weather ring. Arrays of seafood, poultry, beef, salads and sumptuous desserts are among the alluring food that contributes to the show’s special character. Couches and comfy chairs scattered among the tables offer respite for the saddle-weary, while there is plenty of space to relax without feeling crowded. Improvements for 2018 include bigger stalls, different wash racks and a larger all-grass schooling area “We took a lot of our cues from all the great work they do at Spruce Meadows. I would argue we share the same principles about what we’re trying to for the sport and the horses that give so much to us,” he continued, citing British Columbia’s Thunderbird in his comments as well. “We also wanted to be very user-friendly in terms of sponsorship and hospitality so it’s a one-of-a-kind experience for event-goers,” added Charlie. Understandably, riders love the show. Not only does it give their horses a chance to compete at a different venue to break up the weeks they are at WEF, but it also supplies competitors, owners and sponsors with creature comforts. “From top to bottom, every aspect of the Masters is first class, that’s why I enjoy it,” said Ian Millar as he waited for a chef to cut him a slice of turkey at one of the buffet tables during a break in the competition. Asked how he compares it to the other shows in which he has participated around the world, he stated, “It’s absolutely one of the very best,” while naturally giving a shout-out to Spruce Meadows, yet noting the two are very different categories of shows.